Settle in and spread out in your spacious home away from home. Why settle for a cramped room when you can settle into a spacious sanctuary? With one or two bedroom fully furnished condominiums, we’ve got you covered with home-style comfort. Enjoy a homemade dinner with the family. Step out on your balcony to watch a glorious Florida sunset. Or take the night off and watch a movie on your flat screen TV. Summer Bay Orlando is a cashless resort. Our two-bedroom (sleeps 8) is the perfect solution for a big family. With room for 8 guests, this open floor plan lets you spread out and get comfortable. Gaze upon Florida’s beauty from your spacious balcony overlooking our 64-acre lake or beautiful gardens. Wake up refreshed and ready for adventure in your plush bed in one of 2 spacious bedrooms. Pamper yourself in a luxurious master suite with your very own balcony and bathroom with a walk in shower, whirlpool tub and large vanity. The dining and living room areas provide plenty of space to do what you want to do. Forget about having to eat out every day. The airy kitchen with full-size refrigerator, microwave, stove and lots of accessories makes dining in convenient and easy. With a large, flat screen TV in every room, guests can all watch something different at the same time. Extremely convenient in-home washer and dryer makes the visit that much easier. Please note: Actual room features may vary from those pictured here as renovations throughout this resort are ongoing to provide our guests with updated furnishings, amenities and décor. *Limited Availability, please call to confirm. Our two-bedroom (sleeps 6) accommodates 6 guests comfortably. This gem of a vacation home gives you all the space and comfort you desire. Entertain guests at your elegant dining room table or in your comfortable living room. Enjoy tiled floors throughout the villa and a large, flat screen TV in every room. There’s room to spare with a master bedroom, guest bedroom, and queen sleeper sofa. A jetted tub and large vanity add to your luxury experience. Full-size refrigerator, microwave, stove, washer and dryer, and other appliances give the feeling and convenience of being right at home. Our one-bedroom (sleeps 4) is perfect for the small family, with space and comfort to spare. Relax on your balcony overlooking manicured gardens. Eat in with the family in your spacious dining area or cozy up for board games or a movie in your living room. Enjoy home-style convenience with a full kitchen, washer and dryer, and more. Enjoy some privacy with your master bedroom, while kids use the comfy queen sleeper sofa. Your combination shower/jetted tub and large vanity will top off your luxury stay. Just curious and want to watch all the fun? Come on in and saunter about! There’s no charge to enter the park however a wristband must be purchased to experience the park’s featured adventures. Play a game of Bocce Ball, enjoy complimentary access to Parrot’s Landing, the interactive kid’s water playground or just relax and take in the sites. All parks will be open during regularly scheduled hours of operation posted in the current Resort Information Guide, weather permitting). Current schedules are provided at the time of resort check-in and are also available for online viewing. Note: Buccaneer Bay Adventure Park is currently open Wednesday – Sunday. Summer Bay Orlando offers four casual dining options including full-service, fast take-out, poolside and delivery to satisfy your cravings. Grab a burger and brew at Big Kahuna’s Poolside Bar and Grill (View Menu). Keep cool with a tropical drink from Kokomo’s Lakeside Tiki Bar. Dine with your family for some Italian fare from The Italian Kitchen (View Menu). The Recreation team will guide you through all the fun-filled activities and recreation opportunities from their location in the all new Recreation Pavilion. Located here is a state-of the art movie theatre, fitness center, arcade and redemption center, video games, billiards room, resort lounge, Activities and other indoor and outdoor gathering spaces. The fun continues on the pool decks with regularly scheduled entertainment, pool games, karaoke, and celebrations. To view current experiences click here. 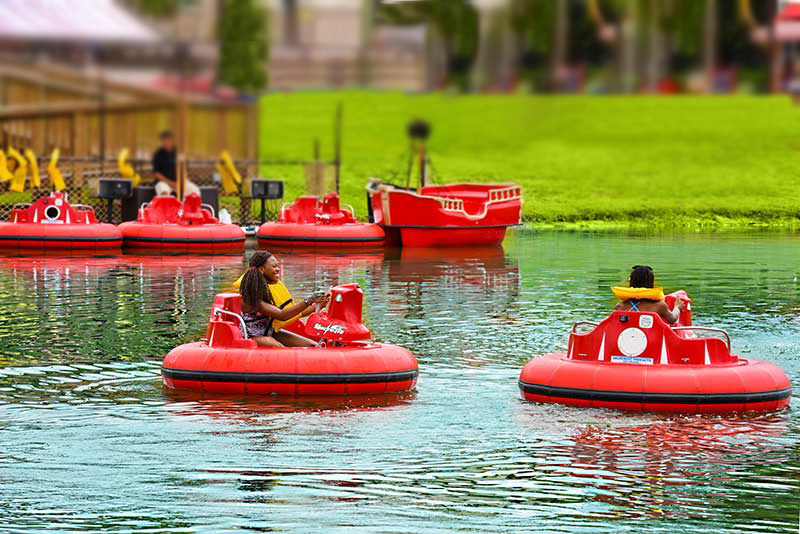 Summer Bay Orlando has a host of fun sports and diversions for the active lifestyle. Start off your morning with Zumba, Yoga or Aquasice. Shoot hoops or play a match on our fully lit basketball, sand volleyball, shuffleboard, and tennis courts, or try a family tour of the resort on a four-person surrey bike. Experience the real Florida on our 64-acre lake. Stroll along our white-sand beach or bounce and climb on our floating aqua-playground. Feel the wind in your hair as you zip across the lake on a wave runner or explore at a leisurely pace by canoe or paddleboat. Then try your casting luck in the bass-fishing capital of the nation. Fish on! Rental and usage fees apply. Click here for an overview of current offerings. Orlando is home to the most famous attractions and theme parks in the world, from Walt Disney World Resort® to the Universal Studios® Orlando Resort, SeaWorld®, water parks and many more. There’s also plenty of live performances and dinner shows and an abundance of restaurants. Central Florida is famous for having some of the best golf courses worldwide. We’re home to the Orlando Magic, Solar Bears hockey, the Predators arena football, Orlando City soccer, and UCF Knights. And don’t forget all the great shopping destinations. There’s a lifetime of activities right around the corner from Summer Bay Orlando Resort. Disney’s Magic Kingdom, home to Cinderella’s Castle, is divided into six distinct lands arranged in a spoke-like formation, all meeting at the top of Main Street USA. Visit Tommorrowland, Fantasyland, Frontierland, Liberty Square, Adventureland and Main Street USA to experience guest favorites including Space Mountain, Thunder Mountain, and the primary residence of Mickey Mouse! It is here that families experience the world famous Disney Magic all year round! Parades, shows, rollercoasters, character meet and greets and seasonal special events including Mickey’s Not So Scarey Halloween and Mickey’s Christmas Party make Disney’s Magic Kingdom a must do when visiting Orlando. Disney’s Hollywood Studios brings the movies to life and provides guests with non stop entertainment and the opportunity to ‘ride the movies’. The famed Sorcerer’s Hat, a stylized version of the magical hat from Fantasia, serves as the park’s central hub. Other guest favorites include The Twilight Zone Tower of Terror, The Chinese Theatre, and Aerosmith’s Rock n’ Roller Coaster. Disney’s Animal Kingdom is a zoological theme park which opened on Earth Day in 1998 and is the fourth theme park built at the resort. The Tree of Life is the icon of Disney’s Animal Kingdom, located at the center of the 580 acre park which is also home to Expedition Everest, Kali Rapids, Kilimanjaro Safaris, Dinosaur, Gorilla Falls Exploration and the all new Pandora – The World of Avatar where guests discover the land that celebrates the magic of nature! Universal Studios, Islands of Adventure and Volcano Bay present a 3-part journey of exploration… At Universal Studios, guests Go beyond the screen, behind the scenes and jump into the action of your favorite films at the world’s premier movie and TV based theme park. At Islands of Adventure, guests depart from a main port to visit 3 themed islands, all emphasizing adventure, including Marvel Super Hero Island which houses two of the most popular thrill rides at Universal – The Hulk and The Amazing Adventures of Spiderman along with Seuss Landing and The Wizarding World of Harry Potter. And at Volcano Bay, the all new and fanciful waterpark which celebrates the notion that Water is Life… Life is Joy, guests experience the carefree attitude the fabled Waturi islanders have embraced on their Pacific isle for centuries. SeaWorld Orlando presents a wonderland of ocean animals, rides and dazzling shows. For more excitement, water-splashing thrill rides and animal encounters, try Aquatica – SeaWorld’s Waterpark in Orlando. And for an up close and personal encounter, there’s SeaWorld’s all-inclusive Discovery Cove. A: Summer Bay Orlando is a cashless resort. Payment Methods Accepted: Room Charges and Visa, MasterCard, and Discover. Q: Is breakfast served daily? A: The fully equipped condos are a great way to prepare family meals while on property. With a Publix grocery store right next door as well as a Denny’s restaurant in front of the property and multiple restaurants nearby, there are a wide variety options for families to enjoy meals together. Q: What are the Check-In/Check Out Times? A: Check in is at 4:00 p.m. and check out is at 10:00 a.m. If a later check out time is requested, please contact the resort operator the evening before checkout. Additional fees may apply. Q: Are Cleaning/Housekeeping Services included? A: Your unit has been prepared for a 7-day stay and is equipped with an in-unit washer and dryer for your convenience. A complimentary towel exchange is offered on Tuesdays and must be scheduled with a phone call to the Front Desk. Additional housekeeping services are available to meet specific needs. Nominal fees apply. Q: What are the Front Desk Hours of Operation? A: The Front Desk in the Clubhouse is open 24 hours a day. Q: Can I have advanced packages delivered to the Resort? A: Any packages that are sent to the property will be delivered to the Front Desk at the Clubhouse. An agent from the Front Desk team will contact recipient to notify of package arrival. There is no charge for packages. Q: Are Pets permitted at the Resort? A: Pets are not permitted at Summer Bay Orlando or any Exploria Resorts destination. A: Summer Bay Orlando resort offers complimentary Wi-Fi throughout the units and public spaces throughout the resort. A Wi-Fi password will be provided at the time of check-in. Q: What Activities/Amenities are available? A: The Recreation team prepares a daily full schedule of activities designed for all ages. Our family-oriented resort offers a full array of activities for all resort guests, with over 80 complimentary features on property. A current listing of activities and amenities available can be viewed on our website. A resort map illustrates resort offerings and a Resort Information Guide of current offerings is also available on line and is distributed at the time of check-in. Q: Is there a fee for each activity? A: While the majority of resort amenities are offered complimentary, some fees apply. Admission to the Lakeside Marina and Aqua Park begins at $12.00 per person for one-day unlimited use. Children 6 and under are free with a paid adult. Rocky Falls Miniature Golf is complimentary for all guests staying at Summer Bay Orlando. Hourly rental fees apply. Guests may enjoy unlimited access to Buccaneer Bay Adventure Park for the new low price of $30.00 per reservation. Eligible discounts are available upon check-in. Q: How do I contact Marketing regarding a promotional package? A: Our Marketing Department will be happy to assist you with any and all questions regarding your recent purchase of a promotional package. Please call 855.750.1818 and an agent will answer your questions. Q: Does the Resort offer Early Check Ins? A: If you arrive on property before your accommodations are ready, an early check-in can be arranged. Early arrivals are welcome to enjoy the resort’s amenities. Notification from the Front Desk team will be made once the accommodations are ready for occupancy. Q: How does the Resort grant Early/Late Check-in Requests? A: Early/Late check-ins will be noted however cannot be guaranteed. Q: How can I extend my Reservation One more Night? Q: How do I submit a Ground Floor/Handicap Unit Request? A: Yes, a request to your reservation can be made, but it is not guaranteed that a ground floor or handicap unit will be available. For future reservations, please inform the reservation agent of any needs you have ahead of time in order to further meet your accommodation needs. Q: Who can I contact with an Online Reservation issue? A: Our Rental department has the most current availability and may have more options than the website offers. Please call 855.849.2205 for questions regarding an upcoming rental reservation or to make a reservation. Owners, Club Exploria Members, and RCI/II Exchangers who have a question regarding a reservation may contact Owner/Member Services directly at 800.654.6102. Q: How much is the refundable room deposit? A: The $150 room deposit collected at the time of check-in is necessary in order to cover any incidentals that may occur during your stay at Summer Bay Orlando. The room deposit is requested during the time of check in and will be refunded during check out. (Please allow 48 hours for the refund to be posted onto your account). Q: How do I request a renovated unit? A: A request to your reservation information can be made, but it is not guaranteed that a renovated unit will be available at the time of check-in. Presently, 2/3 of Summer Bay Orlando has been renovated with the 100% completion by end of 2017. Q: How can I confirm my reservation? A: We will be happy to confirm your reservation for you. Please feel free to contact our Rental Reservations department at 855.849.2205 and we will send you an email with confirmation. Please have the property name, arrival date, confirmation and last name information available while speaking to Rental Reservations. Q: How do I contact a sales agent? Q: How far is the Resort from Orlando International Airport? A: The Orlando International Airport is 28 miles away from Summer Bay Orlando. Based on Orlando traffic, the drive may take anywhere from 30-40 minutes. Q: How far is the Resort from area theme parks? A: Summer Bay Orlando is located just 6 miles away from the Walt Disney World Main entrance. Animal Kingdom is 6 miles away, approximately 10-15 minutes. Magic Kingdom is 11 miles away, approximately 15-20 minutes. Q: How do I request a taxi from the Airport? A: Transportation to the property from the airport is available via Taxi. Please call 407.492.8888. A taxi may range anywhere between $60-80. Q: Does the Resort offer transportation services? A: Yes, we offer complimentary shuttle service to all Disney theme parks as well as Universal Studios. 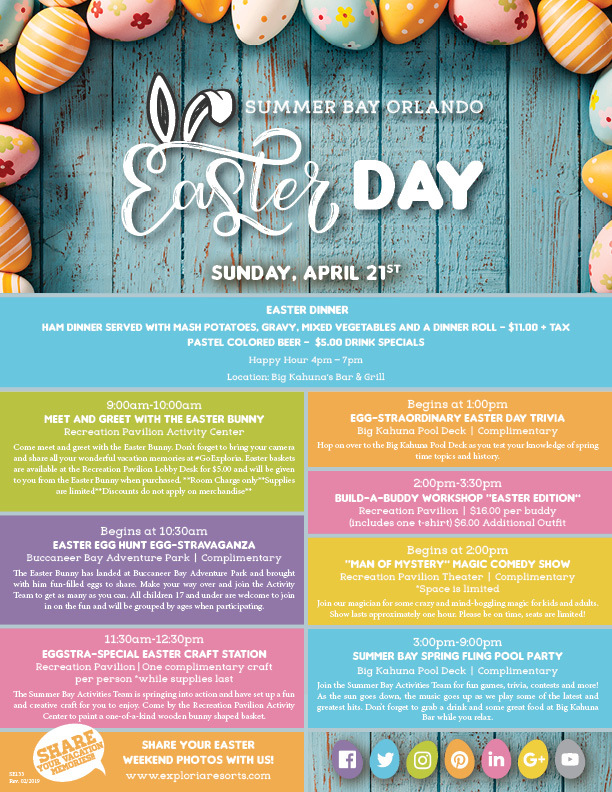 A detailed schedule is available under the Amenities and Activities section of Summer Bay Orlando, and is also provided within your welcome packet. Q: Where can I find the current theme park shuttle schedule? A: The current shuttle schedule is provided under the Amenities and Activities section of Summer Bay Orlando. Complimentary shuttle service is provided to area theme parks to all registered guests. Q: Is there a maximum number of vehicles allowed on property per reservation? A: In order to accommodate parking for all registered owners and guests, one parking space for each bedroom that is reserved is offered. If you have a trailer, RV, or multiple vehicles, please contact the Front Desk and the Concierge team will accommodate you with parking for large vehicles or an extra parking pass.